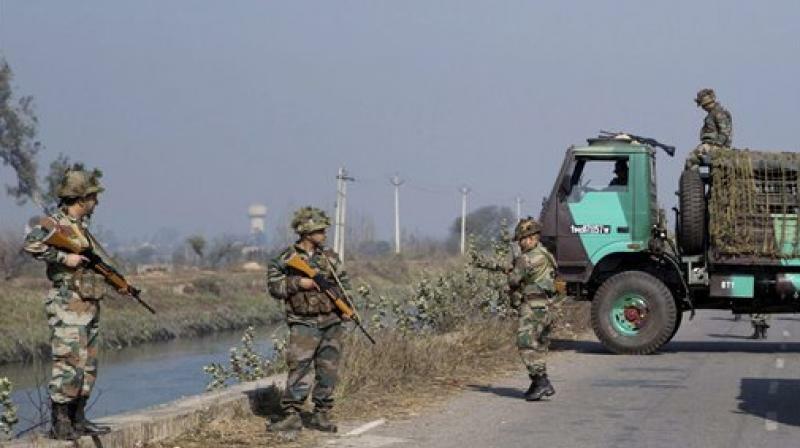 To open the eyes of NDA government over its inaction on OROP (one rank one pension) issue, former serviceman Subedar, Ram Kishan Grewal from Bhivani district, Haryana, commits suicide but the grave incident also offers political mileage to opposition parties in India. Grewal's family squarely blames central govt for his death though unfortunately soldier Ram Kishan's son was manhandled roughly by Delhi cops. 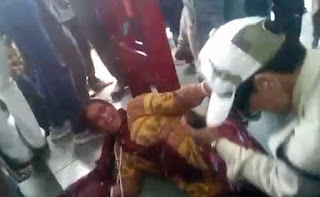 It is really baffling why the opposition leaders who rushed to visit the victim's family to pay condolences were manhandled and arrested by Delhi police and on whose orders. 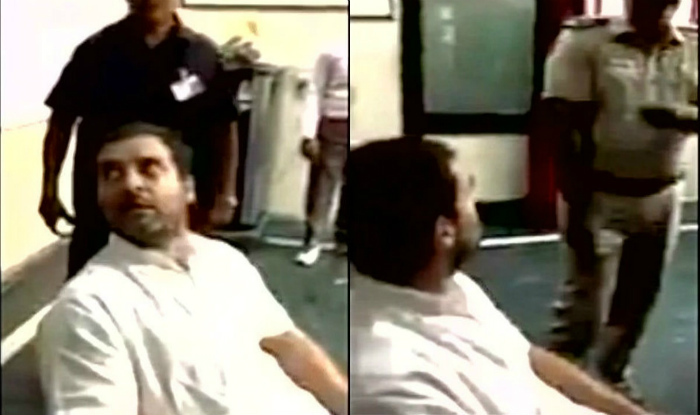 Even Rahul Gandhi, Arvind Kejriwal, Manish Sisodia and Sanjay Singh were not spared and were detained. Do watch the video clips on the links below. It's disheartening to know that the former servicemen of our motherland have been sitting on DHARNA for past over one and half year and all these politicians say is that a committee set by the current govt. is looking into the matter. 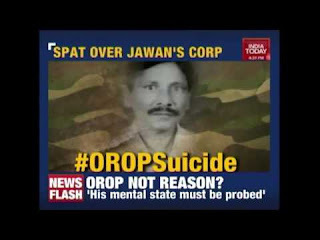 Before killing himself Ramkishan had also written a letter to the defense minister, Manohar Parrikar to implement OROP. In his suicidal note he states that he is taking extreme step for the soldiers and his nation. Has Modi lied to the Indians and deceived soldiers of the nation as claimed by Arvind Kejriwal. Why would a soldier kill himself if OROP has been implemented? On one side, PM on his joyride has been going around places, doing electoral rallies and claiming credit over surgical strike executed by Indian soldiers and ironically on the other side, his govt ordered a huge cut in the disability pension of the very soldiers. Moreover, some army ranks were also downgraded probably to lower their pensions. INKE MANN KI BAAT KAUN SUNEGA ? In favor of Delhiite Soldiers, the Delhi government has made a special policy that it would dole out Rs. 1 crore as compensation to a martyred soldier's family. He has also written a letter to PM to adopt the same policy offering 19 Crores to for the Uri soldiers who were killed by Pak terrorists to show that the central govt holds as much concern for the soldiers. It should also be mentioned here that Delhi govt was the first state government that had given 1 crore to a Delhi police man who had got killed in the line of his duty. Where there is a will there is a way! Ram Kishan was not only twice Rashtrapati Awardee but had also achieved CHIEF OF ARMY STAFF AWARD. Hope, his act brings justice to the Indian soldiers for whom he sacrificed his life. 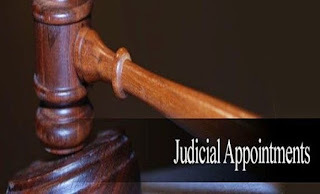 It is highly depressing to learn that Central government of our country is not helping SUPREME COURT OF INDIA at all by stalling the appointments of high courts and supreme court of India to frame a new Memorandum of Procedure for Judicial Appointments. Probably the first of its kind, this I believe is the biggest and unerasable blot on our PM, Modi since he came to power. Modi doesn't seem to have intelligent advisers around him or else he would not have been caught up in such a filthy situation. There are staggering nos in hundreds of vacant posts in Indian courts yet Modi has not taken steps to resolve the issue that has been going on for too long. 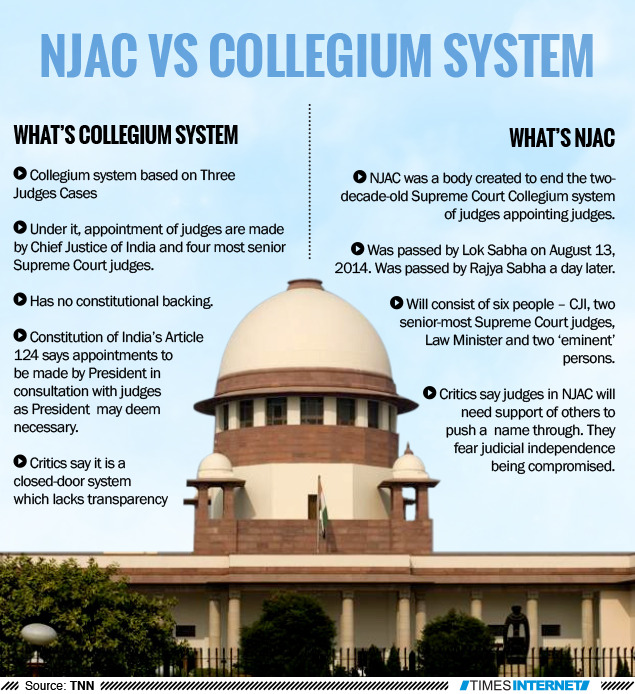 In an ugly allegation coming from Supreme Court of India that the current NDA govt, headed by Narendra Modi is locking out Indian courts, this I believe is, intentionally because SC in the past had stricken off the central govt's NATIONAL JUDICIAL APPOINTMENTS COMMISSION ACT, 2014 passed by the Lok Sabha on 13 August 2014 and by the Rajya Sabha on 14 August 2014 by Modi Govt. that was made only with an intent to get the govt's stake in the appointments and transfer of senior judges to usurp independence of Indian Judiciary for which SC was not prepared at all since this sort of despicable attempt had never been exercised before by any Indian govt in the past. 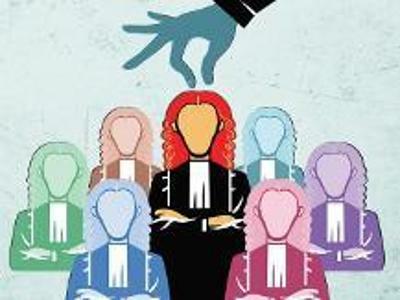 The proverb, YOU SCRATCH MY BACK AND I WOULD SCRATCH YOURS seems to be playing the big role here because central govt seems to be hellbent to get its stake in the transfer and appointments of the senior judges so that later govt could seek favors from those judges appointed by the govt. 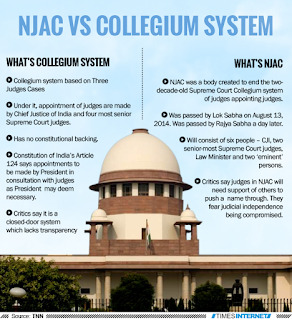 It ought not be forgotten that SUPREME COURT OF INDIA has straightened Indian Governments on multiple occasions handing out historic judgments dispensing justice whenever SC perceived the legislature. This serious accusation coming from the temple of justice must not be taken lightly at all by PMO. I am of the opinion that PM Modi must allow SC at earliest to appoint Judges on its own to get out of this morally reprehensible deadlock or else it would ruin his already dented image further more. Do watch this touchy video clip at the link below as to how our chief justice of India, T S THAKUR broke down in tears in the presence of our prime minister in april, 2016 and nothing seems to have been done. 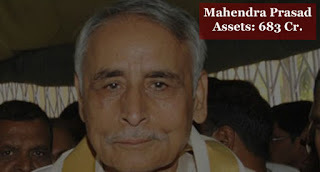 LINK TO CHIEF JUSTICE OF INDIA, T S THAKUR BREAKING DOWN.. If you remember, in 2014 while raising the railway fare by 14.2% right after coming to power, in self defense Narendra Modi had found an excellent excuse that this raise was proposed by UPA govt. and he is merely executing it. Also, the hike in fare was dubbed as a bitter pill smartly by him which he and the railway Minister claimed was important for providing better amenities to the public. If the new government is to follow the steps of the previous government then what is the difference then. 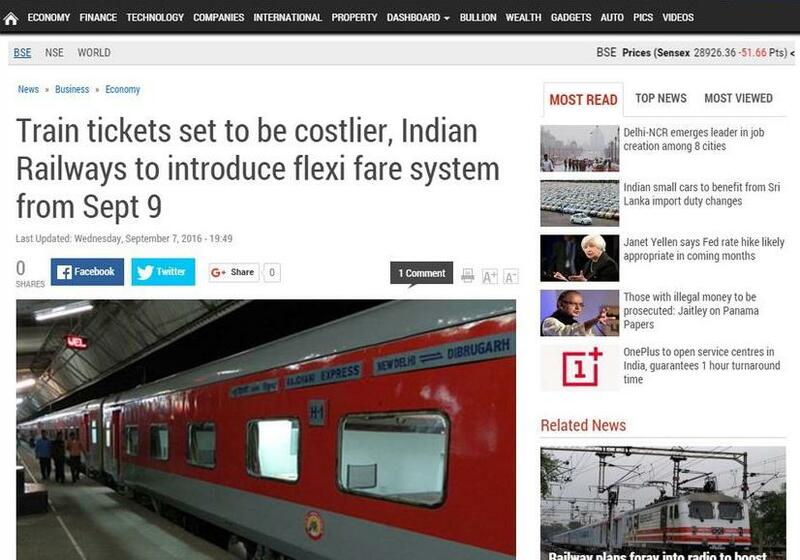 ACHCHE DIN had begun well with train fare hike for the Indians!! And people are still awaiting Achche din after two and half years. Later in the form of classic amenities, the pantry cars from several long distance trains that used to be handy for the passengers had been replaced by e-catering. 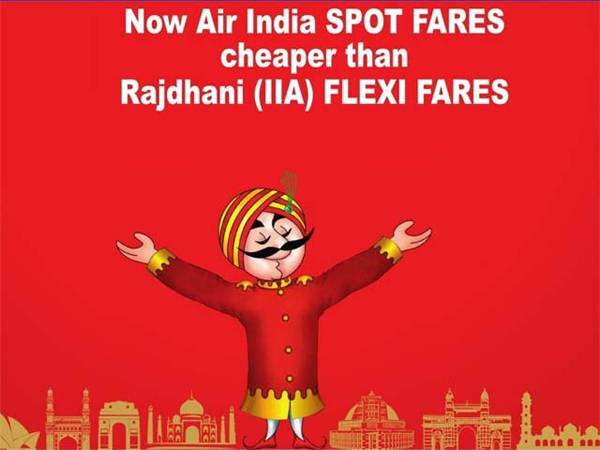 Are they out of their minds to imagine that every passenger is internet savvy? Does every person have internet on his/her phone? But who cares in India? 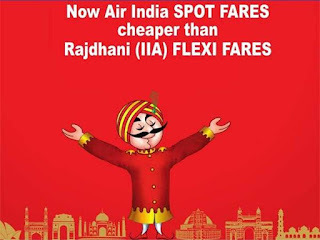 The concept of Surge pricing system in flights in the times of Congress and Uber and Ola cabs' bookings in the times of BJP has already rattled Indians since it compels people to pay more than what is to be paid for commuting one place to other destination. What would one do in such a situation? Nothing but pay helplessly in reluctance. 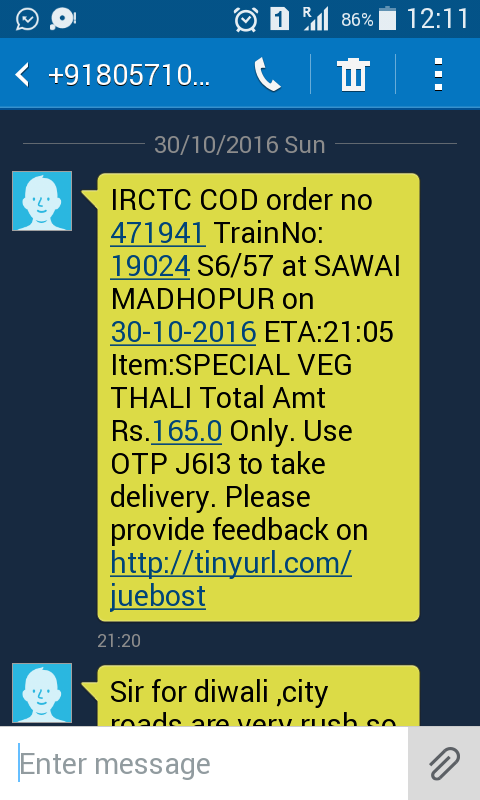 Though, Indian Railways has faced stiff criticism against this system but it justifies it adamantly. How can this blood sucking be allowed and justified by these vampires really amazes me? 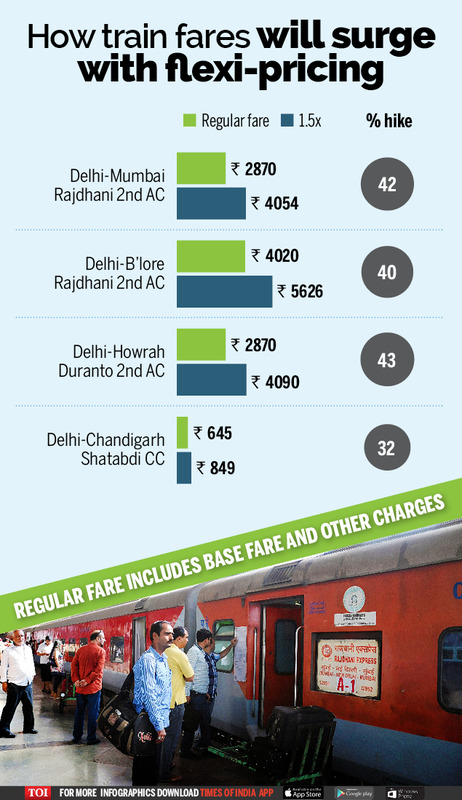 Now the implementation of flexi-fare in Indian railways is going to bleed passengers further more. Majorly, it is going to hit poor and middle class hard where it hurts them more as they would find tough time to get them reservations. Instead of giving the relief to the people, sucking their blood off in the name of development and running the government like previous regime is what it is. 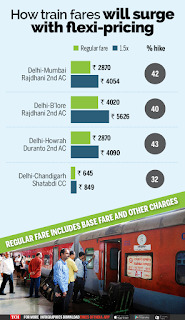 I agree with Ashok Khemka in toto as he describe this, "Surge pricing in train travel exploit citizens' helplessness." 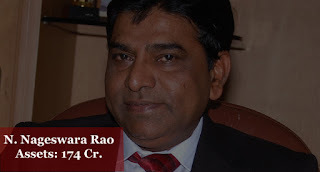 Honest people like him must be in Indian politics so that reforms can be brought in our system. I would not be surprised if Indian buses come under this brutal flexi-fare knife, food products and basic needs as well for that matter if this trend is not nipped in the bud. You wont believe that couple of fellow passengers ordered food through e-catering in my presence during my trip back to Mumbai from Delhi and see for yourself below what they got in return. They were taken for a ride. 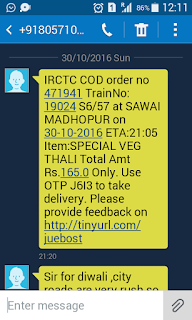 The following photos are the screen shots of one of passengers who forwarded the message to me for my post he received on his phone. 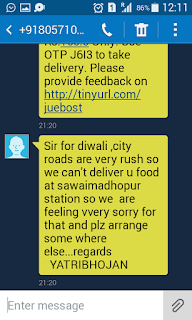 This is a classic example of classic service given to the public. WOULD PM TAKE THIS ACTION IN THE INTEREST OF THE NATION? 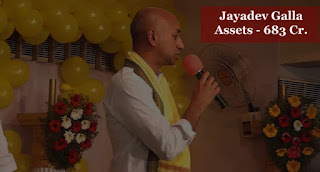 We have often seen PM Modi speaking aggressively and addressing the nation against Subsidies given to Indians that should have been abolished for the sake of India's development and he later even launched a campaign on march 27, 2015 asking Indians to surrender their subsidies who did not need it and subsequently made it mandatory too for certain class to who have been earning above ten lakhs. Ironically, PM finds subsidies a great burden on Indian Exchequer but has not cared to ask Indian politicians to give up on their subsidies of Lifelong Pensions. 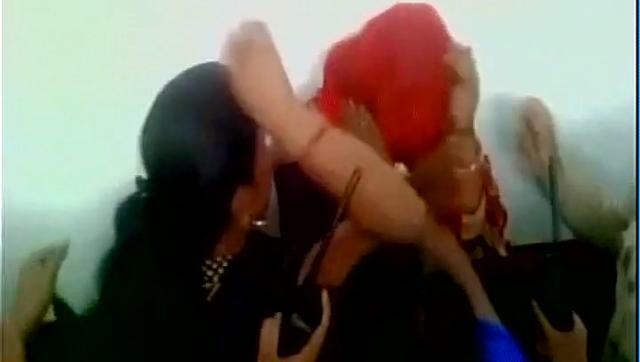 I strongly doubt Modi would even give second thought to what this civilian Geeta Nargundkar has requested. Would he take such an important action in the interest of our nation that has been requested through the following letter by a civilian, Geeta Nargundkar. I endorse & support her views that it is high time their lifetime pension must end for good because we all know what kind of perks and privileges are already given to Indian politician. Moreover, within a short span of five or ten years they amass exponentially their assets, properties, gold, fortune and wealth manifolds. Once in power, they even offer such opportunities to their friends, families and relatives getting them high value govt. contracts. 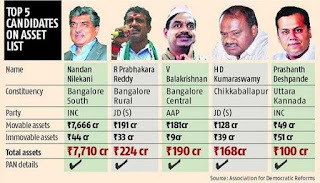 In the times when media is so strong, it is not a hidden fact any longer how these politicians enjoy the highly rich subsidized food in the parliament canteens on dirt prices along with scores of other facilities. Majority of them are rich, some filthy rich and some are even facing never ending investigations for amassing disproportionate assets and wealth. 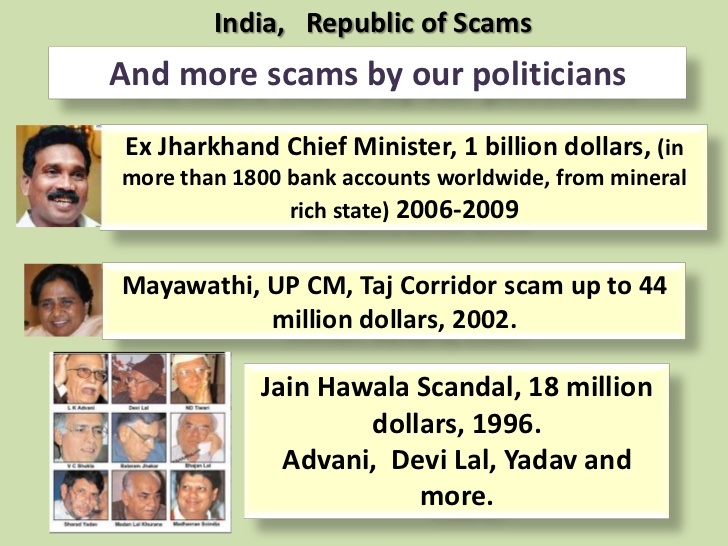 The wealth of our Indian politicians definitely gives a tough competition to several politicians across the world. 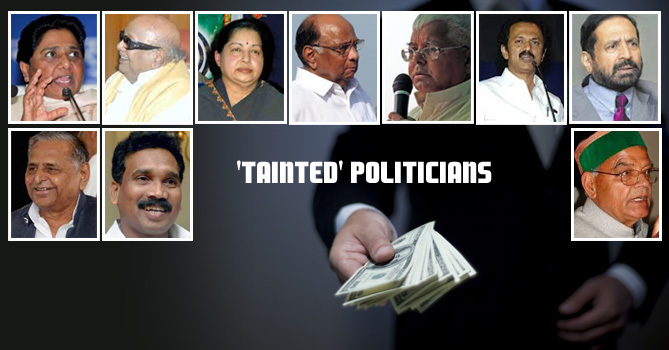 Looking at Indian Politicians' wealth profile and how they lead their swanky lifestyles, do they really deserve lifetime pensions? I have sent this post to PMO as well so that our PM knows how we feel about it. I am pretty sure, most of the Indians would subscribe to her views like I do. Opinion of a civilian ! 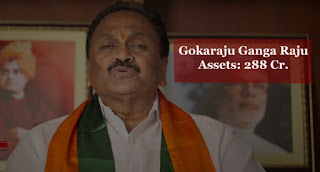 Life time pension accorded for one tenure of politicians - is gross injustice compared to the rest of the government servants who have to put in a minimum of 20 years of service. This is a drain on the public exchequer. No one has been able to explain why young men & women who serve in the Military for 20 years or more, risking their lives protecting our freedom get only 50% of their pay on retirement & Short Service Commissioned Officers who also risk their life for a term varying from 5-14 yrs - get ZERO retirement benefits after their assignment. But Politicians who hold their political positions in the safe confines of the capital, protected by these very same men & women, receive Full-Pay on retirement after serving just one term of 5 yrs. Does it make any sense ??? Abolish, politicians' pension for life. Just like you motivated common people to give up subsidy, motivate MPs to give up numerous undeserving exorbitant perks and subsidies granted unanimously by themselves, including pension. And we hope it starts with yourself... You are a great motivator..
[ If each person who receives this forwards it to 20 people, in 3 days, most people will have this message, and it may lead to a national campaign. If you choose not to pass it on, you still have made a choice. These brave soldiers have given you that right to "freedom" for which they pay dearly...! My Countrymen, I came across this petition with a great cause today which we must all sign since I believe our country's martyrs deserve this. I have signed it the moment I read about it. It is high time we all do something for the free education for their children who have sacrificed their lives in the line of their duty. It should have been done by our leaders long back but we make concerted efforts supporting this petition we can still open their eyes by signing it. I am so excited! Maneka Gandhi responded to my petition. 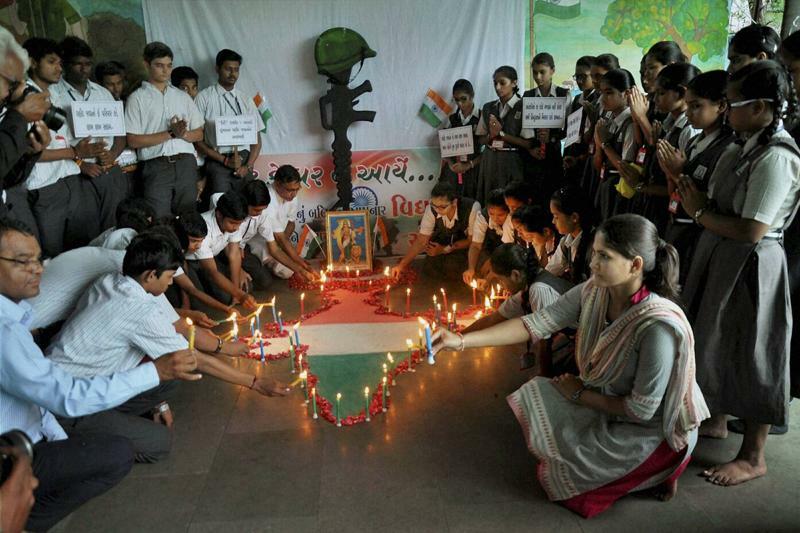 We are asking for free education for the children of India's martyrs and this is a huge step towards victory! Maneka Gandhi has asked our Education Minister Prakash Javadekar for a favourable response to my petition. Over 90,000 people signed my petition and made this happen. I will not rest until my petition is a victory. 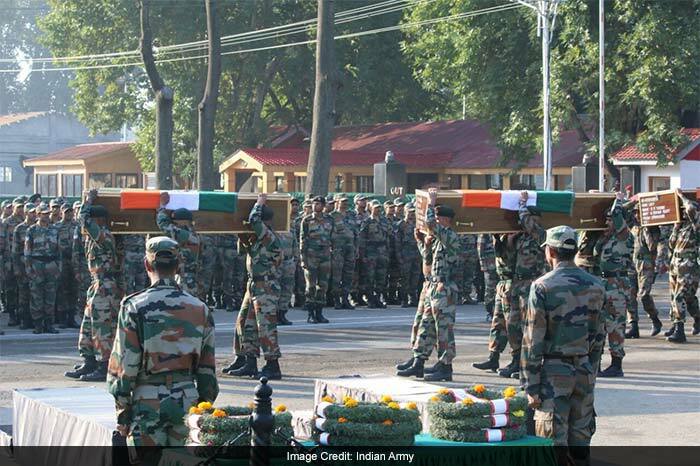 I want to show the Education Minister that people want to help the families of Indian soldiers killed in Uri. ashok, sign my petition and help me reach 1 lakh signatures and show your support for the children of India's martyrs. I just need 10,000 more signatures. I am not a politician or a rich person, but if I get your support I may be able to influence the government and do something for our martyr's families. We all know it well, PM, Narendra Modi has been criticized heavily over and over for not honoring his certain commitments he had made to Indian voters before coming to power. 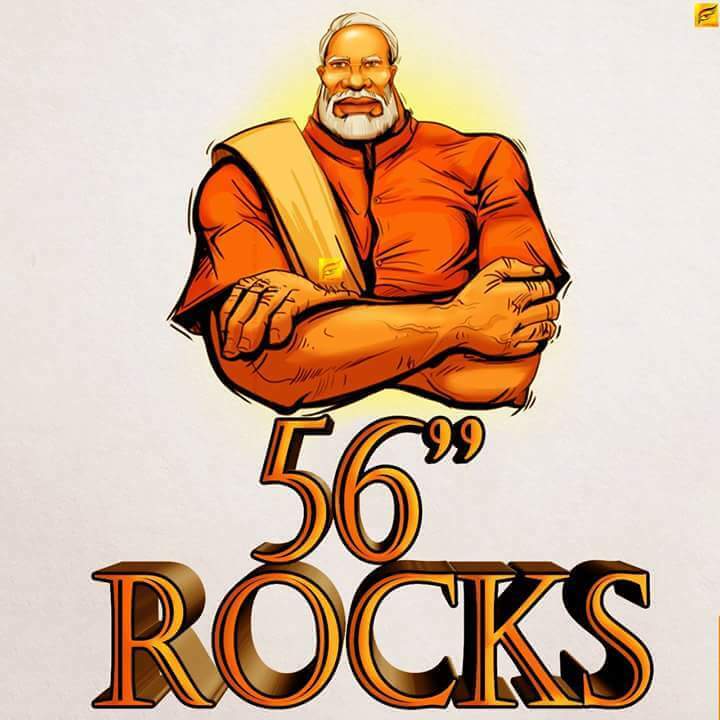 So much so, he has been dubbed as JUMLEBAAZ by oppositions and scores of Indians too after Amit Shah made the greatest mistake of his life that BLACK MONEY commitment a Jumla and not said in literal sense. 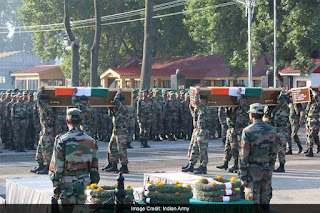 After Pakistan terrorists' surprise attack on 18th Sept on sleeping Indian soldiers in Uri Army Camp at predawn hours in which 17 soldiers were killed, we had seen a national outrage from every quarter to strike back. Verbal Bricks and Stones were thrown at PM, Narendra Modi as to why he is quiet now especially since he had given his interview before attaining power that Indian govt. 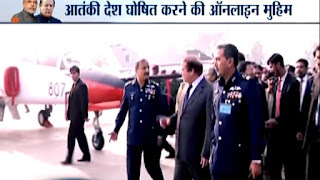 (UPA) should attacked Pakistan in response to repeated terrorists attacks instead of going to America for help. 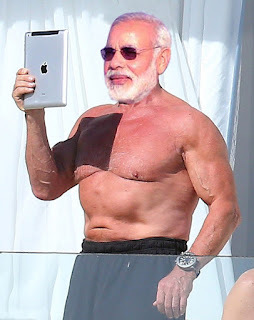 On 29th Sept early in the wee hours, in retaliation Modi ordered our Indian armed forces to go ahead for surgical strike in Pok, Pakistan occupied Kashmir on militants' camps something that has been debated for decades, not done before and strongly demanded by Indians for the safety of Indian territories and its country folks. Almost every Indian who loves his/her motherland has appreciated his bold decision from PMO that has also helped PM gain his lost grounds in a major way especially after losing Delhi and Bihar in post power State Elections. This seems like another lease of life to BJP to me. 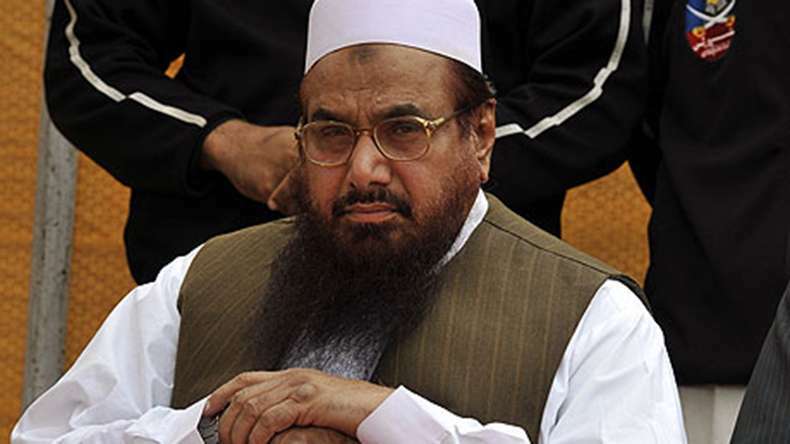 You can render your valuable contribution towards this great cause if you believe strongly that PAKISTAN is one of those countries BREEDING TERRORISTS ON THEIR SOIL, sponsoring and exporting them to carry out killings of innocent people all over world in the name of JEHAD or for other reasons for that matter then you must sign this very important petition on the link at the bottom of this post that was launched in America on 21st September, 2016. Since this petition concerns every peace loving person on our earth who doesn’t believe in hatred & violence at all for any cause, as violent measures & methods can never be justified however important the grounds may be. It gives us a great pleasure to know that in such a short span of time till date, the said petition has been signed online by more than one lac forty thousand people across world. The main purpose of this petition is: Usually if the petitioners’ numbers cross more than one lac then WHITE HOUSE has to respond to it within 60 days and take some concrete step in this direction. America would have to declare eventually PAKISTAN, A TERRORIST STATE officially. We Indians must not forget the fact that PAKISTAN has sent terrorists into India on several occasions and also had given shelter to OSAMA BIN LADEN who had trained, inspired scores of terrorists to kill innocent people all over world. Pakistan still gives free hand openly to many other terrorist leaders like, Hafiz Saeed, Maulana Masood Azhar etc. Remember, how school kids were killed at their tender age in Pakistan when terrorists had retaliated? Here, the proverb, MAN WHO LIVES BY THE GUN, DIES BY THE GUN has proven to be true. Is this is what is happening to Pakistan? Though, Pakistan itself is suffering from terrorists attacks on its own soil, yet it doesn't stop running terrorists training camps. We Indians can play a crucial role to exert tremendous pressure on America by signing it in great number. Can't we take this simple action for our motherland? 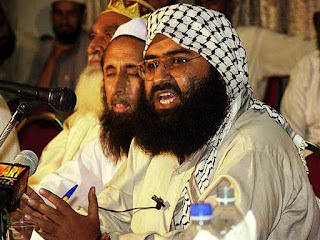 If we succeed in our goal with our concerted efforts then PAKISTAN would have to undergo severe international economic sanctions from INTERNATIONAL COMMUNITIES and Pakistan would have no option but be forced to put an end to such hideous plans that are executed by the terrorists bred by Pakistan. WE NEED NOT SIGN IT NOW, SINCE THIS PETITION HAS BEEN CLOSED REASON BEING IT HAS BEEN SIGNED BY MORE THAN 6.5 LAKH PEOPLE WITH IN A WEEK ITSELF i.e. BEYOND ITS GOAL OF ONE LAKH PEOPLE. If you follow the instructions given below that would save your time hunting for that place where to sign it. 1. Click on the link below and it would straight take you to their website. 2. Then scroll down to the bottom keeping an eye to the right side and you would come across this section of the page that asks for your first name, surname and email address. 3. Instantly you would get a mail for verification. Go to your inbox and verify it. So simple it is. If you appreciate this gesture, do leave your comments and feedback below? No doubt that the cow has been the sacred animal for humans as it has been the best domesticated help to the mankind since old ages. For Hindus the cow has special place in their hearts as it is called, Gau-mata, mother cow. WHO CARES FOR THE AUTHORITIES HERE? After BJP came to power, the cow has become holier than human. So much so, that the cow has achieved the status of becoming Goddess in India now. The law has also been enacted to protect cows and against its slaughter by the various state governments. In those particular states, the new groups have sprung up known as, Gau Rakshak (Cow-protectors, vigilantes) in the wake of new cow culture that has been taking up nationwide roots rapidly. The matter has reverberated and been discussed in Indian parliament too as this NEW NATIONAL PROBLEM has crossed way ahead of tolerance point. We often hear speeches about country’s growth and development from our present political leaders of the ruling party. Is this how our country is being developed? Is this how our nation can lead the world as predicted by OUR PM, NARENDRA MODI? I could not believe when I read the statistics that the export of beef in India has gone up after BJP government came to power in the center? How could it happen without killing cows? THE FARMERS WHO GROW FOOD FOR THE NATION ARE DYING OF STARVATION. WHERE IS THAT INDIA THAT WAS KNOWN TO BE THE LAND OF FARMERS? FOOD GIVER LOOKS FOR FOOD! The following article about the miserable conditions of Indian farmers is enough to bleed our hearts. It is beyond comprehension, term after after we the voters, opt for inhuman politicians who are chiefly responsible for what the Indian farmers are going through who literally do nothing for the food producers of our nation. 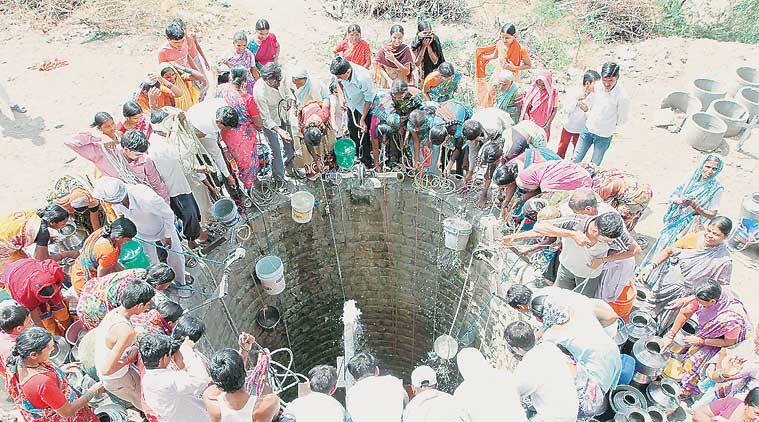 here is an article I wrote after my recent visit to drought hit Bundelkhand. Would appreciate you feedback. Also let me know if you would like to contribute to Swaraj Abhiyan's work in that area. If you don't mind I would like to occasionally share some of my ideas and activities with you. If you do not wish to receive this mail, please let me know on this ID. Her answer still rings in my ears. “Bhaiyya, saawan ke mahine me ek paav daal laye thhe”(Brother, we last bought 250 grams of dal during the rains). I had asked her when was the last time she cooked dal for her family. This was village Mastapur in Tikamgarh district, Madhya Pradesh, which shares its border with Uttar Prad­esh, where the pitiless terrain of the old Bundelkhand region extends. I asked this question to every woman I met during this visit. Usually there was an awkward pause followed by a smile or laughter (“don’t you know the price, babuji?”), but not a single woman claimed that her family consumed dal daily or even regularly. I was travelling with my Swaraj Abhiyan colleagues to various villages in drought-affected Bundelkhand that lies across MP and UP, trying to listen to the footsteps of famine. This was our third visit to Bundelkhand in as many months. The first was in October, when we travelled over 4,500 km through the worst drought-affected districts of the country—from Karnataka to Haryana. Till then we had only read about the plight of farmers in Marathwada. And what we saw was depressing. But nothing had prepared us for what we encountered in Bunde­lkhand. It was not just this drought. It was the third successive crop fai­lure for this region. 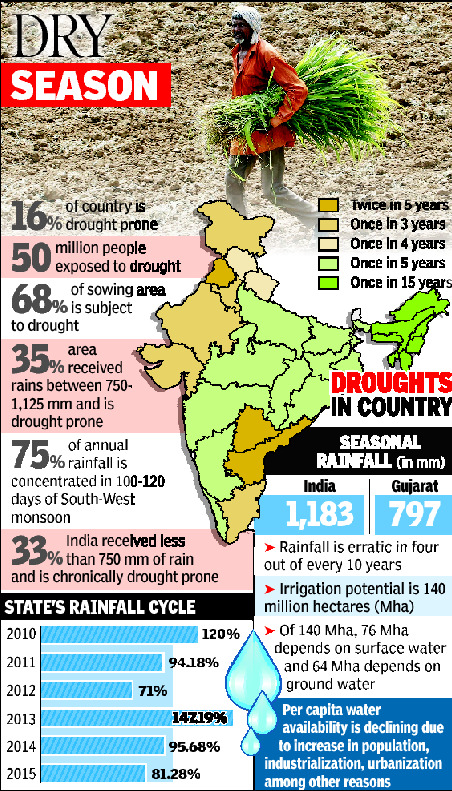 Drought in 2014 was followed by hailstorm during the winter crop of 2015 and then another drought in 2015. The last decade and half has seen nearly ten droughts. This drought was the proverbial last straw. We came back after a couple of weeks to conduct a thorough survey, just in case our own impressions had deceived us. The survey (in collaboration with a local NGO, Parmarth) in 108 villages on the UP side of the border confirmed our worst suspicions: in the month preceding the survey, 60 per cent rural families could not offer milk to their children; 39 per cent had had no dal; 40 per cent reported distress sale of cattle; and 27 per cent had sold or pawned their ornaments in the last eight months. The survey did not catch national media attention, except for some sensational reports on the use of fikar—rotis made of a traditional, wild substitute for wheat and rice­—by some rural poor, mostly adivasis. More than ever, farmers and their families are being driven towards big cities in search of daily wage jobs—once the sole preserve of the landless. This is when we learnt the hard truth: drought is not glamorous. Unlike floods, it does not yield powerful television footage. Images of parched fields, the cliche of drought reporting, are exceptions rather than the rule. Unlike earthquakes, it doesn’t happen in a single stroke. No breaking news, therefore. Rather a gradual, continuous unfolding. It’s cruelly selective, almost Darwinian: it quietly grabs the poorest, the most vulnerable. Calamities and accidents get their stage time on the basis of how much we can empathise. Turns out not a huge amount for much of the Indian middle class. This time we were returning after activists in that area reported further worsening of the situation. Now, drought was visible. Vast stretches of barren, unsown land greeted us. In districts like Tikamgarh and Chh­attarpur in MP and Mahoba and Hamirpur in UP, most farmers have simply left their land fallow, for it’s pointless to sow expensive seeds in cruel, moistureless soil. This would be the fourth successive crop loss for the farmers. This may not be the end of their woes. Scientists tell us that climate change is resulting in higher frequency of “ext­reme weather events”. Climate change is compounding the agrarian crisis. Hundreds of ravenous stray cattle, mostly cows, scourging the field for some straw or tree leaves, announce the arrival of a village. ‘Anna pratha’ (letting off cattle) is an old tradition in Bundelkhand. But villagers tell you that this year the number of cows let loose exceeds anything in the past. As you look at those ­exhausted, lowing cows, those loud TV debates on cow slaughter and beef consumption begin to sound fake and so removed from the real India. For the cattle, this is slaughter by other means. One of the first sights inside every village is a hand pump with a long queue of aluminium utensils. Villagers take you to dry and drying wells. 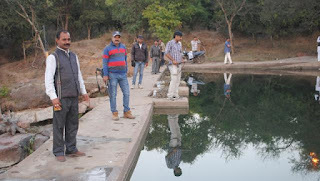 The famous ponds of Bundelkhand are drying one after another. 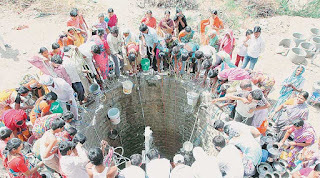 Village elders confirm that they have never seen reservoirs so dry. It’s not because the rainfall this year was the worst ever. 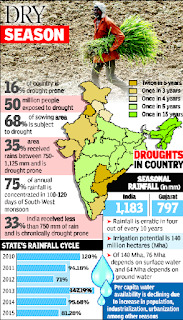 Bundelkhand falls in a rain-shadow area and has seen worse droughts than this. 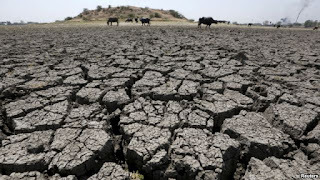 But depletion of forests, neglect of ponds and large-scale stone-mining has left this eco-region more vulnerable to drought than ever before. This is winter. You don’t dare ask the villagers what the situation might be like in the months of April and May. A walk inside the village takes you to locked houses, many more than ever before. Seasonal migration is not new to the people here. The rural poor migrate to Indore, Surat, Delhi and NCR area and all the way from Uttarakhand to Tamil Nadu in search of work. This year, the landless labour have been joined by small and middle farmers. At Jhansi station I met this owner of 12 acres of land, a prosperous farmer by nat­ional standards, leaving for Delhi with his wife and three children in search of daily wage labour. In village after village, you see only a few able-bodied men—mostly just old parents waiting for remittance. You wonder what happens to those families where remittances do not arrive. And you recall Amartya Sen’s theory that famine is not caused by lack of foodgrains but by lack of purchasing power. And what about the state? Harsh Mander, ­activist and ex-IAS officer from MP and one of the Supreme Court-appointed food commissioners, ­reminds us that drou­ght—besides elections and kumbh melas­—used to be a test for bur­ea­ucracy. Extraordinary times when it couldn’t afford its business-as-usual approach. No sign of that in Bundel­khand, whether in MP or UP. There were some exceptions. Some activity had begun in UP when we visited it last. But by and large the state is abs­ent when it is needed most. 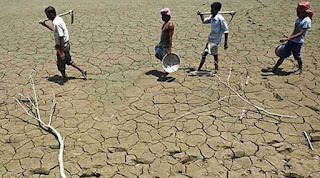 Although there is an official drought manual that mandates contingency plans in such situations, the state governments are at a loss about how to help. It’s not as if they don’t know what to do. 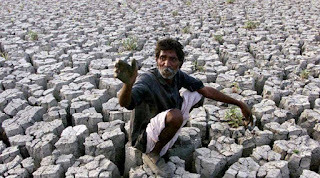 From the days of the Raj, every state has had its Famine Code that spells out the steps to be taken during a drought. 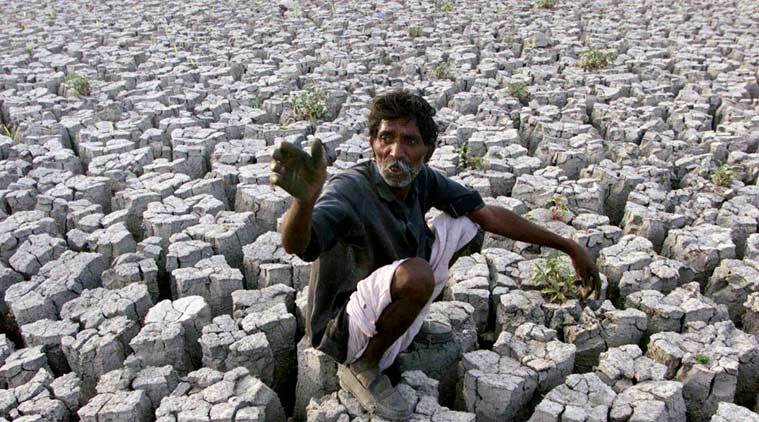 Since 2009 the government has a Manual for Drought Management that meticulously lists all that the Centre and states need to do to cope with a drought. Yet there is little sign of any preparedness, let alone action. The Drought Manual mandates a contingency plan for water and crop substitution at the district level. It did not seem to exist in most places. There is no urgency about repairing water pumps and little forward planning for the coming summer. Yes, the PDS exists and the children are getting their mid-day meals (though no education) in the schools. Madhya Pradesh is better than UP in this respect, for it has implemented the National Food Security Act. 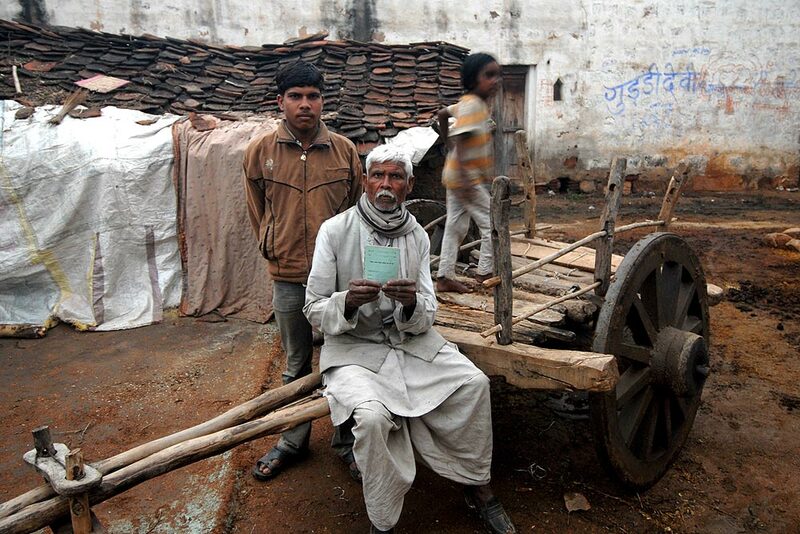 But scores of poor households in each village complain they have no ration cards. And women tell you that their quota of ration (5 kg per person per month) lasts barely a week. There is no special action yet on the ground to provide any additional ration during this period when stocks are running out. The next crop, if all goes well, is still about 10 months away. And if you thought NREGA was meant to provide employment during such emergencies, you are mistaken. 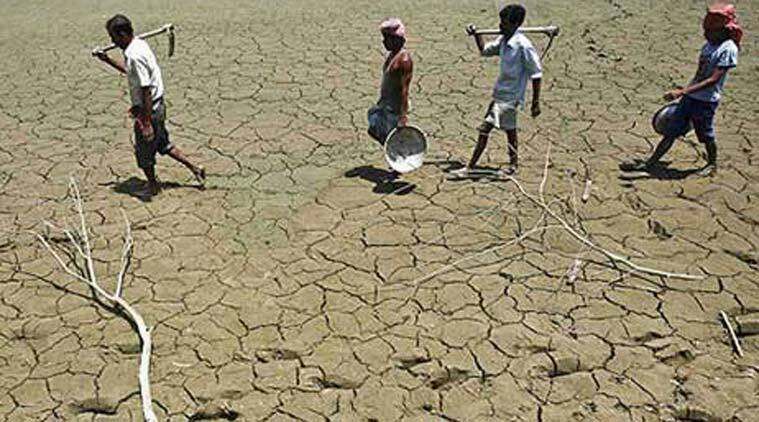 The employment guarantee scheme that originated in Maharashtra precisely to counter drought is not much in evidence—and mostly not dovetailed to this objective. There were some signs of NREGA works in UP, but none in MP. As for crop loss compensation and crop insurance, the less said the better. UP is still to pay the meagre compensation for crop loss during last year’s hailstorm. MP is faster but most of it is mired in local corruption. We are back in the city. Running water in washbasin; a full thali looks obscene. Drought doesn’t exist for the media. We are discussing the weather: it might affect the odd-even scheme. My mind is still fixated on the other odd-even scheme in Bundel­khand: odd day you get to eat, even day you don’t. 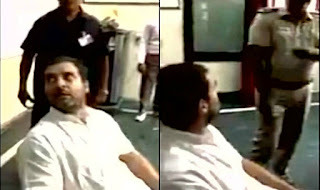 During a press conference, a smart journalist gets up; “Are you playing politics? Preparing for elections?” Yes, I wish to say. They are planning to give representation to animals in Parliament and I am planning to contest that election. 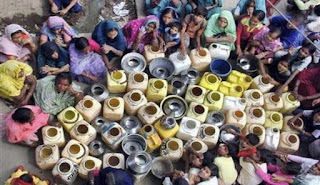 WATERLESS INDIA OR LIFELESS INDIA! 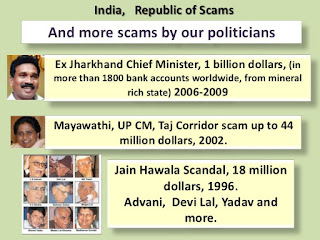 THIS IS HOW THE CORRUPT POLITICIANS AND BUREAUCRATS PAY YOU BACK IN INDIA! 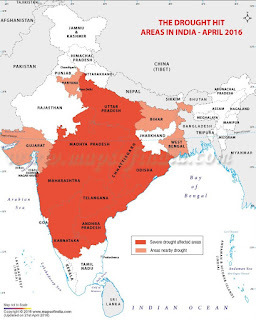 There have been predictions of deficient and sufficient rainfalls in India that are contrary to each other by the weather dept of the country, the Indian Meteorological Department (IMD). In 2016, we have witnessed the worse ever droughts in many states of our nation so much so the water had to be sourced to the affected regions via trains and tankers on regular basis. 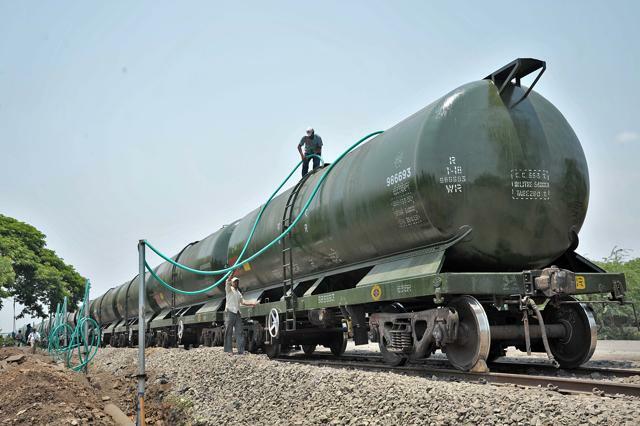 What a sight, the water is travelling in Indian trains! Though it may look strange but this has been done in the past. Haven't we taken lessons from our earlier mistakes. 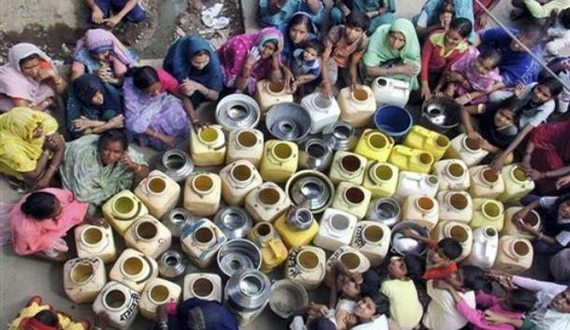 If we are facing the same problems of acute water shortage then what have we achieved all these years? Were we sleeping in air-conditioned rooms? 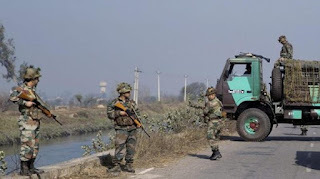 It's been on air on almost every channel how the villagers are hunting for water (life) and the situation is so grave in some areas that the water bodies are being guarded by armed forces at places by the local governments. In Bundelkhand, drought-hit, gunmen have been hired to guard water body of potable water. If you look at the shocking statistics that keep appearing you would be horrified to learn that about 330 million Indians have been affected by this year's drought as has been reported by media. 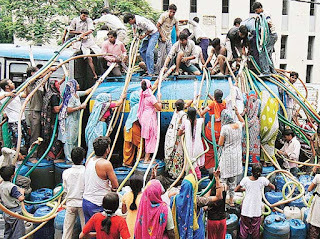 Lots of channels have been to ground zeroes to cover stories on this grave issue of water deficiency right on the center stage of our so called developed nation. Shouldn't we throw that tag of developed nation aside we have been chanting about in pride on and off? Wherever drought has hit you would notice that for miles and miles the stretches of lands are treeless more or less. Majorly, this situation has been carved deftly by our own hands by chopping trees mercilessly in the name of development and also not taking enough measures for water conservation, tree planting drives and last but not the least is the massive corruption in irrigation depts though there are multiple other factors of water shortage. Mind it fellows, this is no nature calamity but a grave dug by our own hands. Every year we spend millions on awareness campaigns as to how important water conservation is for all of us. Do we really care for it? There are hundreds of corrupt politicians and bureaucrats who acquire key positions in the state governance who are actually to be blamed for this utterly sorry state of our country. There are scores of corrupt charges and cases against them yet nothing really happens to them to curb corrupt practices for they easily get away without being punished. HAIL LOOPHOLES OF THE SYSTEM WE LIVE IN! Do you see how the tax payers money does disappear into their overseas accounts. I had read a special write up on irrigation scams in Maharashtra wherein the nexus of politicians, bureaucrats and Govt. Contractors who had amassed wealth illegally and shared the booty among themselves since 1984 till 2014 that was meant to be spent on irrigation projects in Maharashtra to get the water supplied to the parched land of the farmers who became poor to poorer under bank debts to make their ends meet. 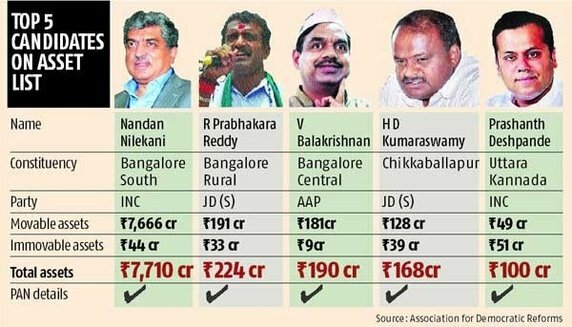 It's beyond our comprehension that the central govt sent about 74000 Crores to Mahrashtra's respective governments for number of irrigation projects that kept on raising its cost in the range of 700% to 7000% in some cases due to intentional delays and surprisingly not a single project has been completed till date and some of them didn't even exist in reality but on official papers. I found the following content pretty relevant and decided to put it here for you guys. "All Rights Reserved." -ASHOK SHITAL. Watermark theme. Powered by Blogger.